FAIRFIELD, Conn.— Sacred Heart University students, staff and faculty spent time on their winter breaks making a difference by volunteering in the community and abroad. A group with Volunteer Programs & Service Learning (VPSL) went to Puerto Rico in December to help with hurricane relief and another group with Campus Ministry went to Jamaica in early January to help residents with disabilities. Most recently a group of 17 undergraduate and graduate students participated in CURTIS Week, a program that immerses and engages students in community projects throughout Bridgeport. The program bears the name of SHU’s founder, Bishop Walter W. Curtis, converted to an acronym for Community Understanding and Reflection through Inner-city Service. Several nonprofits and schools throughout the neighboring city benefited from the program. On a Wednesday afternoon a group of students were at the Connecticut Institute for Refugees and Immigrants (CIRI), a nonprofit agency in Bridgeport that provides legal and social services to immigrants and refugees in the state to help them become self-sufficient, integrated and contributing members of the community. In the attic, students sorted through boxes and filed documents – a task that would go unfulfilled if it weren’t for the volunteers. The group stayed at Mary Immaculate Convent in Bridgeport throughout the week. Each day the group split up and volunteered at a different nonprofit in the city. Student leader and senior Caroline Flynn said it was her second year participating in the program. “I really like it and I like doing service where SHU is. There’s a need for it, so it’s a great opportunity,” said the business management student. Each evening, the entire group went to a different congregation to learn about parishioners’ faith and culture. While at the CIRI students said they were excited to visit a Buddhist temple that night as it would be a new experience for them. In Kingston, Jamaica in early January, 11 students, two graduate assistants and a staff member worked with the nonprofit group Mustard Seed Communities (MSC). The international nonprofit organization is dedicated to caring for vulnerable populations throughout the developing world. It provides care to over 600 children and adults with disabilities, children affected by HIV/AIDS and young mothers in crisis in Jamaica, Nicaragua, Dominican Republic, Zimbabwe and Malawi. For a week, the group stayed at one the MSC locations, Sophie’s Choice, a home for children with special needs. Junior Michael Zawadzki of Dracut, MA, said he wanted to go on the trip so he could take his passion for serving others abroad. “I never did an international service trip before.” Zawadzki, an exercise science major, said his high school partnered with MSC for a service trip to the Dominican Republic and always regretted not going so he knew he couldn’t pass up the opportunity at SHU. During the week Zawadzki and his peers helped feed residents morning and night, interacted with residents, played games with residents and helped with a variety of projects. “We were just present,” Zawadzki said, who eventually got used to not checking his phone all the time and learned to live in the moment. Clarke said her family is from Jamaica. The work she did for residents who are overlooked “shined a light on the truth that they don’t talk about.” Clarke said she was able to bring back the truth to her family and find other ways to help MSC. In December, a group of 12 students led by professors Ron Hamel and Denise Griffin went to Puerto Rico to work with the organization Community Collaborations International (CCI) to help with hurricane relief efforts. The group worked to lessen the devastation on the island caused by Hurricanes Irma and Maria in September 2017. They stayed in Rio Grande and did most of their work in Guaynabo City. Griffin said the group worked at three different sites, but most of the group’s time was spent repairing a damaged concrete roof for a disabled veteran. “We stripped tar, chiseled concrete, identified cracks, mixed concrete, filled and patched holes and anything and everything else that needed to be done,” Griffin said. 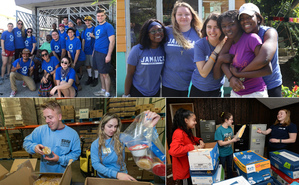 PHOTO CAPTION: Puerto Rico and Jamaica mission trips (top) and CURTIS Week volunteers at the CT Food Bank and the Connecticut Institute for Refugees and Immigrants.